Cannabidiol[CBD] is the main non-psychotropic component of the glandular hairs of Cannabis sativa. It displays a plethora of actions including anticonvulsive, sedative, hypnotic, antipsychotic, and anti-inflammatory and neuroprotective properties. It is a major phyto-cannabinoid, accounting for up to 40% of the Cannabis plant's extract, that binds to a wide variety of physiological targets of the endocannabinoid system within the body. Although the exact medical implications are currently being investigated, CBD has shown promise as a therapeutic and pharmaceutical drug target. In particular, CBD has shown promise as an analgesic, anticonvulsant, muscle relaxant, anxiolytic, antipsychotic and has shown neuroprotective, anti-inflammatory, and antioxidant activity, among other currently investigated uses[1, 2]. 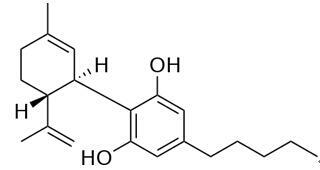 Cannabidiol was isolated from marijuana in the late 1930s, but only in the 1963 were its structure and stereochemistry first elucidated. Early studies focusing on CBD pharmacology started in the 1970s, with the first relevant finding concerning its hypnotic and anticonvulsant properties, published in 1981. Since then, a large body of pharmacological effects has been demonstrated, both in preclinical and in clinical studies. So far, two membrane receptors for cannabidiol, both coupled to G protein and named CB1 and CB2, have been identified. While CB1 receptors are mainly expressed in the central and the peripheral nervous systems, CB2 receptors have been reported to be more abundantly detected in cells of the immune system. Moreover, two orphan G protein-coupled receptors, GPR119 and GPR55, possibly activated by multiple different cannabinoid ligands, have been recently proposed as novel cannabinoid receptors. Being used in combination with delta-9-tetrahydrocannabinol as the product Sativex, cannabidiol was applied for the following indications: 1) as adjunctive treatment for symptomatic relief of spasticity in adult patients with multiple sclerosis[MS] who have not responded adequately to other therapy and who demonstrate meaningful improvement during an initial trial of therapy ; Sativex was also given a Notice of Compliance with Conditions(NOC/c) by Health Canada for the following indications: 1) as adjunctive treatment for the symptomatic relief of neuropathic pain in adult patients with multiple sclerosis; 2) as adjunctive analgesic treatment in adult patients with advanced cancer who experience moderate to severe pain during the highest tolerated dose of strong opioid therapy for persistent background pain. The correct use of CBD in human therapy necessarily requires basic information related to pharmacokinetics. Cannabis derivatives are usually inhaled or orally administered. Other routes, including rectal, transdermic, eye drops, aerosols and intravenous have been used in a small number of studies so that the relevance of findings is limited. Recently, it was demonstrated in rabbits that sublingual administration of a solid CBD/beta-cyclodextrin complex might provide an alternative formulation for sublingual administration. The pharmacokinetics of CBD is quite complicated and in many aspects resembles that of Δ9-THC. Once taken orally, CBD bioavailability ranges between 13% and 19%, due to a marked first-pass effect, while the systemic bioavailability of inhaled CBD in a group of cannabis users was 31%(range 11– 45%). The plasma pattern was similar to that of Δ9-THC. Daily oral doses of CBD 10 mg/kg/day chronically administered resulted in mean plasma concentrations of 5.9–11.2 ng/mL. CBD is rapidly distributed when intravenously administered, and easily passes the blood–brain barrier. CBD shows a prolonged elimination; its terminal half-life is about 9 h, and it is excreted preferentially in the urine, both free and as its glucuronide compound. Cannabidiol impairs hepatic drug metabolism in several animal species, and inhibits mouse hepatic metabolism through the inactivation of specific cytochrome P450 belonging to the 2C and 3A subfamilies. The metabolism of CBD showed biotransformation routes typically observed for cannabinoids. It undergoes multiple hydroxylations, oxidations to carboxylic acids, beta-oxidation, conjugation and epoxidation. Conjugation with fatty acids, first observed with Δ9and Δ8-THC, provides a potent means of increasing the lipophilicity and, hence, tissue accumulation. CBD-7-oic acid together with CBD glucuronide represent the most abundant products of CBD metabolism detected in human urine. Unlike Δ9-THC a remarkable percentage of unchanged CBD is excreted in the faeces. Cannabinoid pharmacology is a field rapidly expanding and the therapeutic properties of cannabinoid receptor agonists include analgesia, muscle relaxation, immunosuppressant, antiinflammatory and antiallergic effects, improvement of mood, stimulation of appetite, antiemesis, lowering of intraocular pressure, bronchodilatation, neuroprotection and antineoplastic effects. Despite the emerging evidence regarding therapeutic activities of CBs, their effective introduction in clinical use is still controversial and strongly limited by the unavoidable psychotropic effects exhibited by many of them. Since it was previously demonstrated that CBD binds with a low affinity to both CB1 and CB2 cannabinoid receptors, much research was aimed at recognizing CB1 and CB2 independent modes of action for this phytocannabinoid. To date, different molecular targets have been proposed. The first evidence that CBD can bind to sites different from cannabinoid receptors was offered by the observation that natural CBD and the[+]-synthetic one both stimulate the type-1 vanilloid receptor. Other studies indicated that CBD also binds to 5-HT1A and such an interaction was suggested to account for the attenuation of cerebral infarction size occurring during ischemia and also for its anxiolytic effect. It has been also reported that CBD may behave as an allosteric modulator at μ and δ opioid receptors, even if the effects occur at very high levels of phytocannabinoid, so that this modulation cannot be expected to contribute markedly to the CBD actions exerted in vivo. However, although CBD displays very low affinity for both CB1 and CB2, it has been reported recently that it can operate as a CB2 receptor inverse agonist and this may, at least in part, contribute to its widely documented antiinflammatory properties. Furthermore it is commonly recognized that many CBD effects are mainly due to its antioxidant activity as first demonstrated by Hampson et al. (1998) that exposed rat cortical neuron cultures to a toxic level of the excitatory neurotransmitter glutamate. On that occasion, the authors showed that CBD exerted a potent antioxidant activity, resulting in a more protective effect than either ascorbate or α-tocopherol, against glutamate-mediated neurotoxicity. The neuroprotective actions of CBD, mainly due to its antiinflammatory and antioxidant properties, have been well documented. Recently, a neuroprotective mechanism of CBD has also been confirmed in a mouse model of ischemia, where CBD explicates the cerebroprotective action via a cannabinoid receptor-independent myeloperoxidase-inhibiting mechanism, in addition to a 5HT1A receptor action. It has also been demonstrated that CBD reverses binge ethanol-induced neurotoxicity, once again, via a cannabinoid receptor independent antioxidant mechanism. The potential of CBD to attenuate the excessive formation of peroxynitrites induced by glutamate also contributes to its neuroprotective effects, as demonstrated by the in vitro results pointing to the ability of CBD to induce the prevention of retinal apoptosis. Cannabidiol exhibits very low toxicity in humans and in other species: the LD50 after intravenous administration to rhesus monkeys was 212 mg/kg. The oral LD50 has not been established, but in 1981 Rosenkrantz showed that an oral dose of CBD 20–50 times larger than the intravenous route is required to initiate severe intoxication. CBD does not cause relevant CNS alterations. Moreover, a large body of studies failed to reveal teratogenic or mutagenic effects induced by CBD[27, 28]. Laprairie RB, Bagher AM, Kelly ME, Denovan-Wright EM: Cannabidiol is a negative allosteric modulator of the cannabinoid CB1 receptor. Br J Pharmacol. 2015 Oct;172(20]:4790-805. doi: 10.1111/bph.13250. Epub 2015 Oct 13. Pertwee RG: The diverse CB1 and CB2 receptor pharmacology of three plant cannabinoids: delta 9-tetrahydrocannabinol, cannabidiol and delta9-tetrahydrocannabivarin. Br J Pharmacol. 2008 Jan; 153(2]: 199-215. doi: 10.1038/sj.bjp.0707442. Epub 2007 Sep 10. Mechoulam R, Shvo Y. 1963. Hashish. I. The structure of cannabidiol. Tetrahedron 19: 2073–2078. Carlini EA, Cunha JM. 1981. Hypnotic and antiepileptic effects of cannabidiol. J Clin Pharmacol 21: 417S–427S. Pertwee RG. 2006. The pharmacology of cannabinoid receptors and their ligands: an overview. Int J Obes[Lond] 30: S13–S18. Brown AJ. 2007. Novel cannabinoid receptors. Br J Pharmacol 152: 567–575. Mannila J, Järvinen T, Järvinen K, Jarho P. 2007. Precipitation complexation method produces cannabidiol/beta-cyclodextrin inclusion complex suitable for sublingual administration of cannabidiol. J Pharm Sci 96: 312–319. Consroe P, Kennedy K, Schram K. 1991a. Assay of plasma cannabidiol by capillary gas chromatography/ion trap mass spectroscopy following high-dose repeated daily oral administration in humans. Pharmacol Biochem Behav 40: 517–522. Samara E, Bialer M, Harvey DJ. 1990. Pharmacokinetics of urinary metabolites of cannabidiol in the dog. Biopharm Drug Dispos 11: 785–795. Bornheim LM, Everhart ET, Li J, Correia MA. 1993. Characterization of cannabidiol-mediated cytochrome P450 inactivation. Biochem Pharmacol 45: 1323–1331. Harvey DJ, Samara E, Mechoulam R. 1991a. Comparative metabolism of cannabidiol in dog, rat and man. Pharmacol Biochem Behav 40: 523–532. Harvey DJ, Samara E, Mechoulam R. 1991b. Urinary metabolites of cannabidiol in dog, rat and man and their identification by gas chromatography-mass spectrometry. J Chromatogr 562: 299–322. Leighty EG, Fentiman AF Jr, Foltz RL. 1976. Long-retained metabolites of delta9and delta8-tetrahydrocannabinols identified as novel fatty acid conjugates. Res Commun Chem Pathol Pharmacol 14: 13 –28. Wall ME, Brine DR, Perez-Reyes M. 1976. Metabolism of cannabinoids in Man. In The Pharmacology of Marijuana, Brande MC, Szara S[eds]. Raven Press: New York, 93–116. Pertwee RG. 2005. Pharmacological actions of cannabinoids. Handb Exp Pharmacol 168: 1–51. Bisogno T, Hanus L, De Petrocellis L et al. 2001. Molecular targets for cannabidiol and its synthetic analogues: effect on vanilloid VR1 receptors and on the cellular uptake and enzymatic hydrolysis of anandamide. Br J Pharmacol 134: 845–852. Mishima K, Hayakawa K, Abe K et al. 2005. Cannabidiol prevents cerebral infarction via a serotonergic 5-hydroxytryptamine 1A receptor-dependent mechanism. Stroke 36: 1077–1082. Campos AC, Guimarães FS. 2008. Involvement of 5HT1A receptors in the anxiolytic-like effects of cannabidiol injected into the dorsolateral periaqueductal gray of rats. Psychopharmacology[Berl] May 1. [Epub ahead of print]. Kathmann M, Flau K, Redmer A, Tränkle C, Schlicker E. 2006. Cannabidiol is an allosteric modulator at muand deltaopioid receptors. Naunyn Schmiedebergs Arch Pharmacol 372: 354–361. Thomas A, Baillie GL, Phillips AM, Razdan RK, Ross RA, Pertwee RG. 2007. Cannabidiol displays unexpectedly high potency as an antagonist of CB1 and CB2 receptor agonists in vitro. Br J Pharmacol 150: 613–623. Hampson AJ, Grimaldi M, Axelrod J, Wink D. 1998. Cannabidiol and[-] delta9-tetrahydrocannabinol are neuroprotective antioxidants. Proc Natl Acad Sci USA 95: 8268–8273. Hayakawa K, Mishima K, Nozako M et al. 2007. Repeated treatment with cannabidiol but not delta9-tetrahydrocannabinol has a neuroprotective effect without the development of tolerance. Neuropharmacology 52: 1079–1087. Hamelink C, Hampson A, Wink DA, Eiden LE, Eskay RL. 2005. Comparison of cannabidiol, antioxidants and diuretics in reversing binge ethanol-induced neurotoxicity. J Pharmacol Exp Ther 314: 780–788. El-Remessy AB, Khalil IE, Matragoon S et al. 2003 Neuroprotective effect of[-]delta9-tetrahydrocannabinol and cannabidiol in N-methyl-D-aspartate-induced retinal neurotoxicity: involvement of peroxynitrite. Am J Pathol 163: 1997–2008. Rosenkrantz H, Fleischman RW, Grant RJ. 1981. Toxicity of shortterm administration of cannabinoids to rhesus monkeys. Toxicol Appl Pharmacol 58: 118–131. Dalterio S, Steger R, Mayfield D, Bartke A. 1984. Early cannabinoid exposure influences neuroendocrine and reproductive functions in male mice: I. Prenatal exposure. Pharmacol Biochem Behav 20: 107–113. Matsuyama SS, Fu TK. 1981. In vivo cytogenetic effects of cannabinoids. J Clin Psychopharmacol 1: 135–140. Major non-psychoactive constituent of Cannabis. Exhibits multiple bioactivities including anticonvulsant, anxiolytic and anti-inflammatory effects. The (+)-isomers were more active than the (-)-isomers. ChEBI: An cannabinoid that is cyclohexene which is substituted by a methyl group at position 1, a 2,6-dihydroxy-4-pentylphenyl group at position 3, and a prop-1-en-2-yl group at position 4. Non-psychotropic constituent of cannabis that is anticonvulsive, antihyperalgesic and neuroprotective in vivo . GPR55 and weak CB 1 antagonist (IC 50 values are 0.445 and 3.35 μ M), CB 2 receptor inverse agonist and inhibitor of anandamide uptake (IC 50 = 27.5 μ M). Also a weak agonist at VR1 vanilloid receptors (EC 50 = 3.5 μ M). Cannabidiol, a constituent of the cannabis plant, has been receiving considerable attention of late for its potential therapeutic utility, including potential anxiolytic, anticonvulsant,anti-inflammatory, and neuroprotective effects. Cannabidiol has a complex pharmacology. In contrast to THC, cannabidiol has minimal affinity for CB1 and CB2 receptors and produces no intoxication. The effects of cannabidiol in combination with THC have been mixed, with some data suggesting it may reduce THC’s mood-altering and cognitive effects, while others show no effect. If oral cannabidiol reduces cannabis intoxication, it could be a potential medication to treat CUD. However, Haney et al. tested a range of cannabidiol doses (200–800 mg) in combination with active and placebo cannabis and found no cannabidiol effect on the subjective, reinforcing, or cardiovascular effects of smoked cannabis, providing little support for cannabidiol’s utility as a medication to reduce cannabis’ positive reinforcing and subjective effects. 13956-29-1 US $1000.00 / KG 1KG 99% 500 kgs Hebei Guanlang Biotechnology Co., Ltd.
13956-29-1 US $160.00 / g 0.01kg 99.9% 600kg/month Hebei Huanhao Biotechnology Co., Ltd.